The state government of Andhra Pradesh has recently launched a new platform that is targeted towards the startups and college students. The name of the program and website is “Make in AP.” With this scheme, the state authority wants to encourage people to work on their innovative ideas, and develop it with use of technology. Ideas, which are worthy, will be put to test. The scheme will develop and boost the manufacturing services within the state. Thus, business enthusiasts will be able to stay and continue production within the borders of Andhra Pradesh. Development of business sector – This platform is ideal for small startup companies. Interested business enthusiasts will be able to develop and pitch their ideas. If the ideas are viable on a long-term basis, and uses technology, then these will be considered by the community. Betterment of facilities – This scheme will not only assist in better delivery of goods and services, but will also pave the path for overall progress in all specified fields. Inclusion of technology – The inclusion of technology is the most essential aspect of this scheme. NASSCOM is also associated with this program. The ideas must make use of IoT, blockchains, AR or VR and AI or ML technologies. Establishment participation – Apart from applicants, around 50 corporates have also participated in this endeavor. The presence of these established organizations will offer the much-needed resources for testing the viability of the ideas. Assistance from mentors – All applicants will be able to develop their ideas, with the assistance of reputed and experienced mentors. Applicants will have access to more than 100 mentors, in various fields. Estimated participation – The state government is hopeful that by the number of total applications will cross the 15,000 mark in a very short time. Startups and colleges – Both new business organization owners and college students will be able to take part in this scheme. It is not for the established organizations. College students will have to apply on behalf of the institute. Rewards for encouragement – There are cash rewards, and other incentives for winning candidates, mentors and established participation. It will boost their operations by many folds. Access to market – The candidates who manage to attract the eyes of the authority, and win on the final day will receive more than just cash rewards. They will also attain assistance to sustain the business idea. Apart from this, adequate and direct market access will ensure in revenue generation on a long-term basis. Themes for development – For the time being, the state government has selected eight separate themes. The ideas, pitched by startups and colleges must be associated with these themes. Residential criterion – Only people who are legal residents of Andhra Pradesh will be able to submit their applications. Type of beneficiaries – Only college students, and startup owners will be permitted to submit their ideas. ID proof – All candidates will have to submit their personal identification documents. The Voter card, PAN card, Aadhar card are some documents, which qualify for the purpose. Startup related papers – If the applicant is the owner of any organization, then he/she must submit necessary documents. PAN card and trade license, issued in the name of the company are essential papers. Academic documents – In case the applicant is still a student, he/she must submit admission and course related documents, issued and signed by the college authority. The Make in AP portal has been designed and launched for interested business enthusiasts and college students, who desire to work on sustainable and innovative ideas. Interested candidates will have to fill in an online application form. For this, ecah individual will have to click on the link http://www.makeinap.in/. It will give them access to the official page of Make In AP platform. Once the candidate clicks on the menu button, he/she will get a list of options. It will open a small online application form. Here, the applicants will have to type in name of the startup and designation, all contact details, domain preference, preferred technology and a sort description of the proposed idea. Applicants can also upload a crisp PowerPoint presentation with this online application. This will offer a better idea to the sorting officials. After this, the applicant needs to click on the “Submit” button to save the application. In case the students of any college want to take part in the unique scheme, then they will have to click on http://www.makeinap.in/apply-now-colleges.html to make an enrollment accordingly. A similar online document will pop up on the screen. Once the person fills in the necessary details, this application must be saved by clicking on the “Submit” button. Once all applicants are received, the respective departments will choose among these unique submissions. It is the responsibility of the state government to offer proper platform for future generations to develop their entrepreneurship skills. 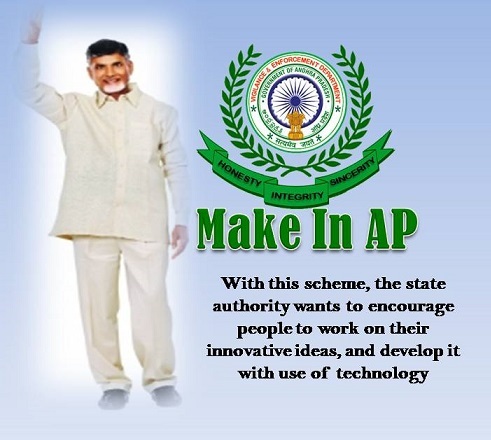 With Make In AP, the state authority offers information and technology to interested candidates, to develop the feasibility of their innovative business schemes.